The Whole Shebang. How many times had I heard people mentioning the craziness that is Alta's definition of the term: every damn thing on their extensive small plates menu for a total of $350? I'd wanted to indulge in this forever, but though opinions on how many people are necessary to consume this spread vary, one thing seemed certain—five people is way too few. So with only four other friends to explore the menu with, we did the best we could without getting it all. I started with a mint julep, just to get things rolling. Mmm. 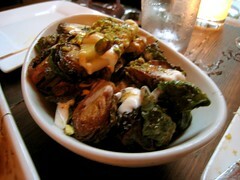 We ordered a number of small plates, and above are the crispy brussels sprouts, lamb meatballs with lebne, a bacon-wrapped olive stuffed with an almond, and sauteed broccoli rabe. 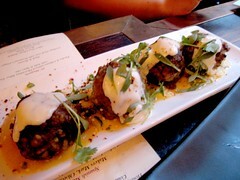 Of these the tender, savory meatballs were the hit, followed by the sprouts, which had been paired with crème fraiche, pistachios, and an apple cider reduction. 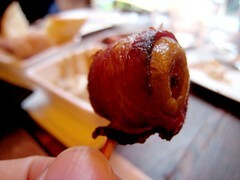 To me the bacon-wrapped olive, despite being, y'know, BACON, was salty and just alright, but the others scarfed them down. 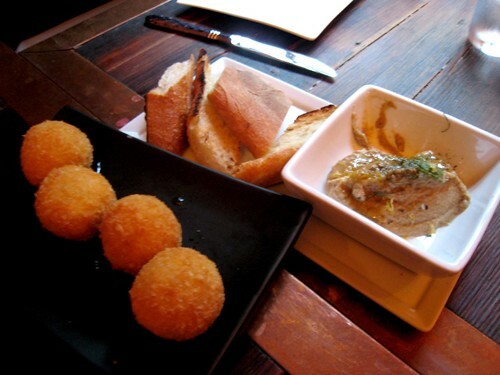 I loved the crisp, tangy fried goat cheese balls, which arrived atop a sweet, gooey puddle of lavender-infused honey. But there was something odd in the flavor of the smoked eggplant and lebne dip; the menu describes za'tar, honey, and mint lemon zest, but there seemed to be something else present too that I can't put my finger on (helpful, I know). It was okay. 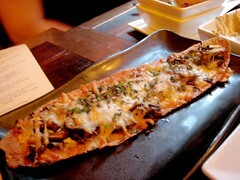 The "coca," described as a Catalonian flatbread and covered with roasted mushrooms, fresh ricotta, and truffled cheese, disappeared lickety-split. 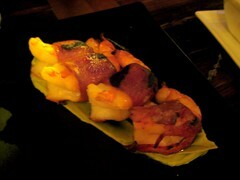 So did the chorizo-wrapped shrimp, four large, crisp specimens to an order. Less so the ricotta parmesan gnocci, which while tasty were a little bit too rich and heavy for the day. 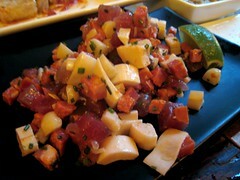 Tuna tartare, which came with hearts of palm, chorizo, and macadamia nuts, was something more like a salad and while fresh and light tasting, could have used a bit more acidity and/or salt somewhere, I think. For dessert there was a cold cantaloupe soup, with an herbal note from either mint or basil (I can't remember which). I think I couldn't get used to the texture of the soup, which was almost as if it had been thickened with corn starch. 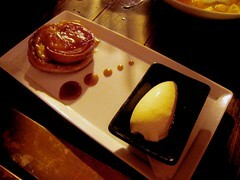 I liked the flaky tart better, which was filled with sticky apricot (I think). Most of us were too full to take more than a bite though. Alta was pretty good overall and perfectly charming; romantic, too, if you want it to be. 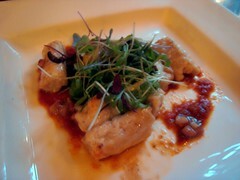 Though nothing stood out as being super amazing in particular, most of what we ordered was tasty. I feel like I've sampled enough so that I don't need to be all crazed about doing the Whole Shebang, but still, I might be back again if I'm looking for an interesting place to eat and drink. 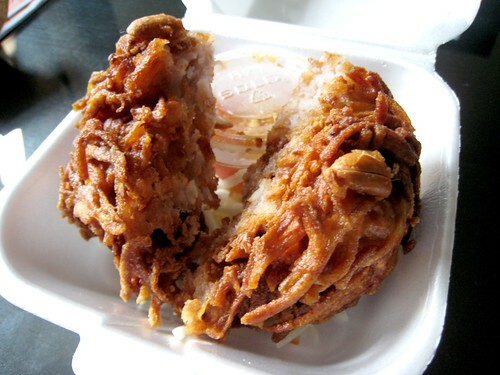 This fried monster is the "taro pancake" appetizer from Yajai in Astoria. I'm not sure I would recommend it though—this solid block of taro shreds was fried way too hard and tasted mostly of oil, and the whole peanuts studded throughout didn't add anything to it, either. 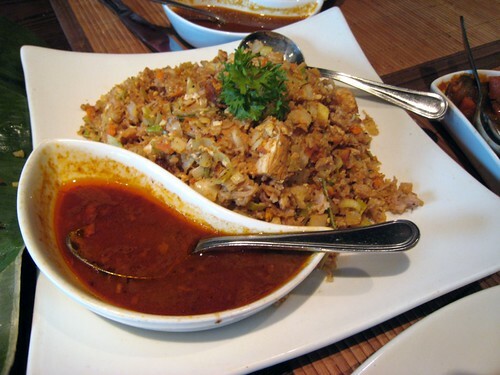 Still, for the other items on its menu Yajai remains probably one of the best in the area; they offer pretty decent curries, salads, and of course, pad thai and pad see-ew. Among other Astorian friends, Yajai seems to be everyone's standby Thai takeout place, and for good reason. I'll be the first to admit that it wasn't the antiques, the jewelry, or the clothing that drew me to Brooklyn Flea: it was the food. 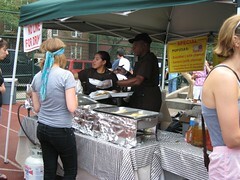 Specifically, the wares of the vendors from Red Hook that had sought refuge amongst the hipsters and bargain-hunters. 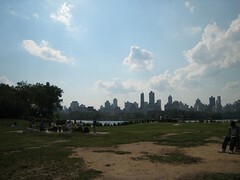 One Sunday I gathered up a handful of friends and we set out from Astoria to Fort Greene. 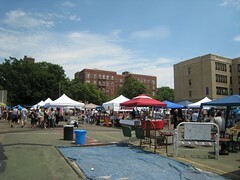 After walking from the subway and sweating all over the place, one of the first things I did once I reached the flea market was make a beeline to water myself with a beverage. 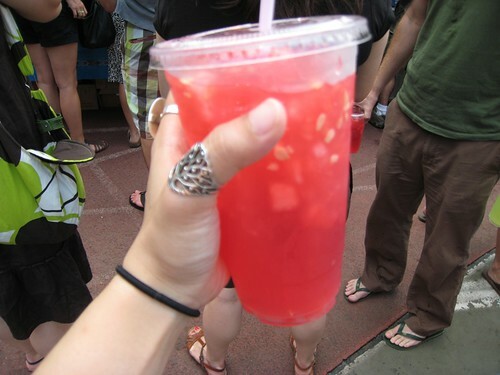 The Red Hook vendors didn't have the cashew fruit drink that I had loved so much last year, but they did have watermelon juice. Packed with small chunks of the fruit itself, the icy juice wasn't very sweet but was still the perfect antidote to the overwhelming heat. 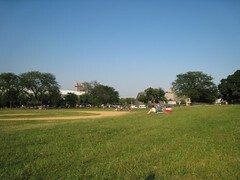 The seven of us spread out onto different lines, acquiring various food items for the group. 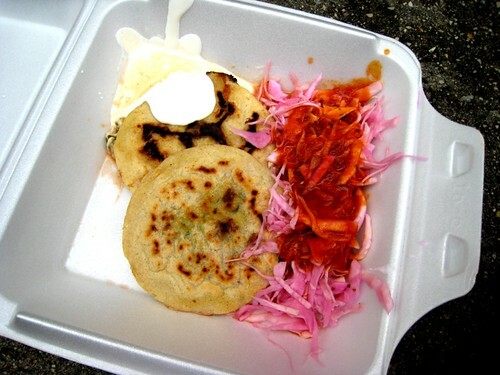 AL and XJS picked out pupusas, one filled with loroco flower and cheese, and another that I can't remember now. 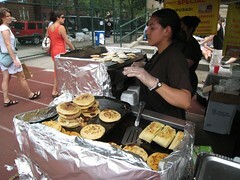 The fat cornmeal patties were rustic, piping hot, and totally tasty—awesome. 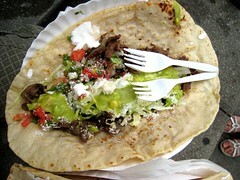 One with chicken, and one with beef: huaraches! Each necessitating two hands and at least several mouths in order to consume. Folding those suckers in half and biting into them sideways seemed to be the only way we could pull it off. Stabbing at them with forks worked, too. After eating we all poked around the market for a while. 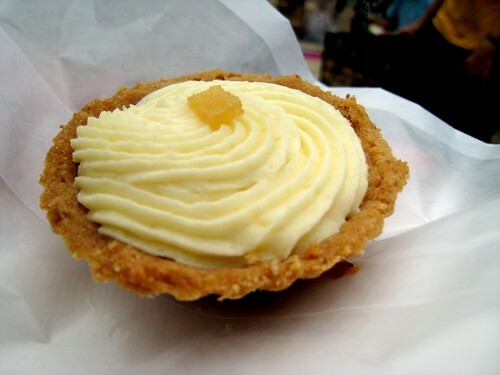 DL picked up this rhubarb tart from Whimsy & Spice, who were also giving out samples of their excellent spiced shortbread cookies. I tried the honey lavender, the brown sugar gingerspice, and the chocolate orange cardamom, and all were really good. And then it started to rain. Like mad! 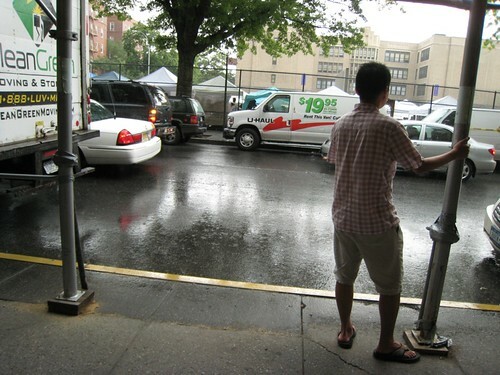 We sought shelter on the steps of a building, under some scaffolding, while trying to figure out where to head next. It seemed the only sensible thing to do was to head towards more food. So we hopped on a train to New Amsterdam Market by South Street Seaport (after rejecting the Unfancy Food Show as too complicated to get to). 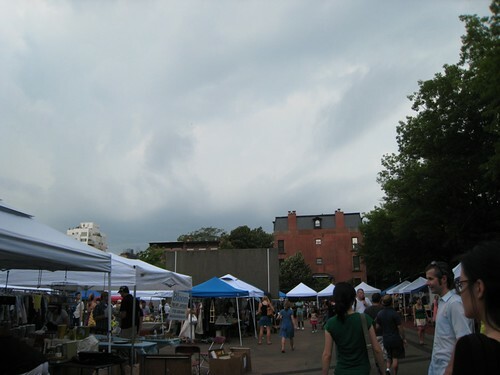 The rain had stopped by the time we came out of the station, but the market was almost closed. 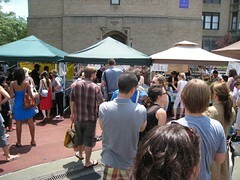 Nonetheless there were plenty of treats to be had, both for sampling and for purchasing alike. 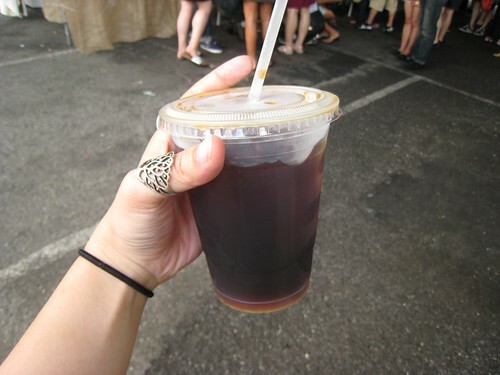 I was too full to try much though, so I just bought this cup of cold-brewed iced coffee (black, please) at the New York Coffee Society booth. After hanging out for a while (and peeping Olafur Eliasson's waterfalls, anyone else think they just look like something sprung a leak?) 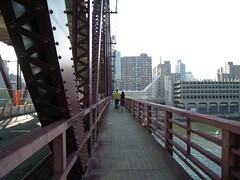 we all parted ways, since it looked like it was about to rain again as well. 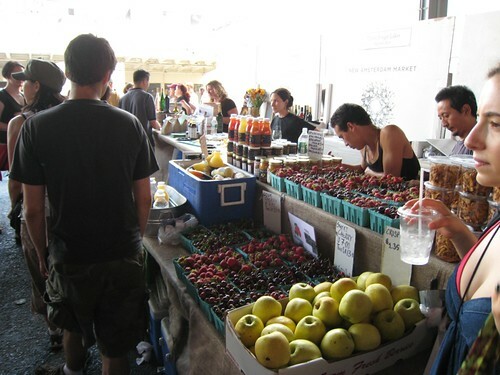 Just another day of food-centric frolicking in New York City…. Before Nirvana I stopped in at Amai Tea & Bake House nearby and picked up this assortment of six cookies: Green Tea, Earl Grey and Currant, Chai Almond, White Tea and Strawberry, Hojicha Sesame, and Lemongrass and Ginger. Over the course of the next few days I tried them all, with mixed results. 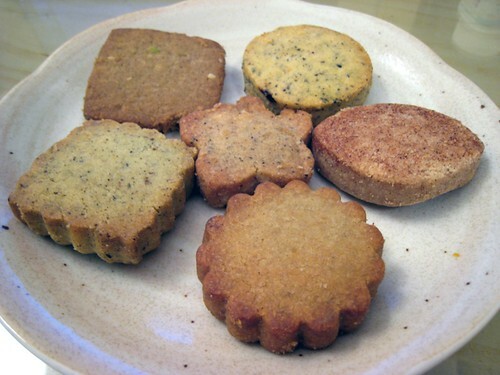 They were less crisp than I prefer in a shortbread cookie, but that may have been due to the high humidity in the air (I left them out on my counter, though still in their wax envelope). The tea flavors were subtle, and the fruit flavors strong; I liked the nuttiness of the Hojicha Sesame, but the Chai Almond didn't have much almond flavor at all. The cookies were three for two dollars so I only bought six and didn't get to the last few flavors, but after this experiment I think I'm good with what I've tried. 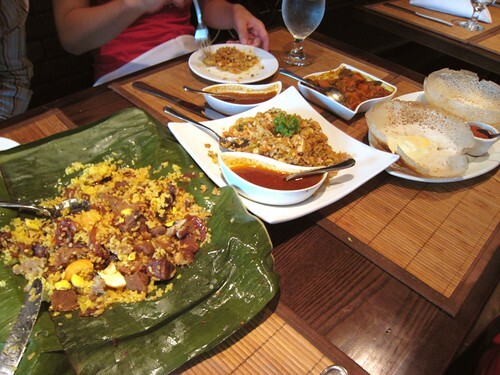 About a month ago, JL, XJS, and I sat down to an exploration of Sri Lankan food at Nirvana Cafe & Bar, in Gramercy. 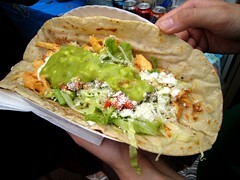 I'd tried some of this restaurant's offerings at the Choice Eats event, and theirs had been among my favorite plates. I had told myself I would go to check it out ever since. At first I was worried. Shortly after we sat down this plate of lentil or chickpea crackers was set down in front of us, but boy were they bad. 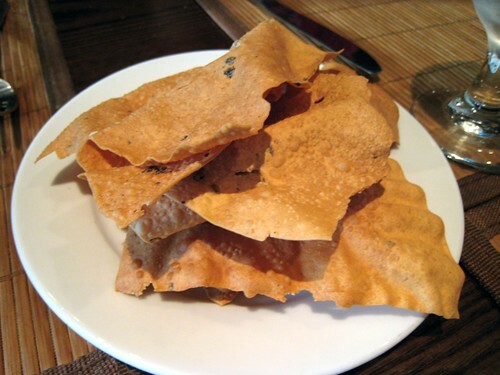 The pappadum were bendy and tough, not at all crisp like they should have been. My guess is that they had sat out for a while, and with the day's incredible humidity, had soaked up moisture and turned sodden. 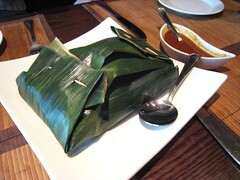 Our mellow server was eager to help us make the right choices though, so under his direction we dug into an incredible lamprais with lamb: a Dutch-influenced packet of rice, marinated lamb, caramelized eggplant, sweet, spicy onion relish, pieces of ash plantain, a fried hard-boiled egg, and a salty fried fish ball wrapped in a banana leaf. 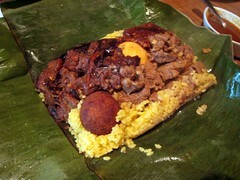 Once mixed together, the dish was sensational: the rice was tender and aromatic and infused with beef broth, shrimp paste, and all the flavors of the other components. Despite how oily it was, I kept going back for more. We also got the string hopper kottu, "shredded, steamed rice noodles sautéed with vegetables and egg served with curry sauce." 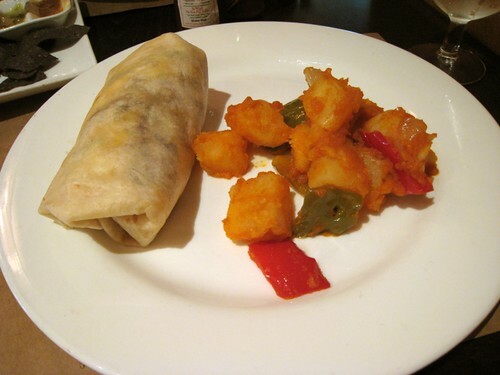 This was okay but a little bland, and only when I added hot sauce from the small dish the server brought over did I find it tastier. The chicken pieces dispersed throughout were on the dry side and didn't seem well marinated. At Choice Eats I had tried their kottu roti (the same dish as above but made with pieces of roti) and liked it a lot, but somehow this was far less interesting. I was excited for the hoppers, bowl-shaped crepes made from creamed wheat and served with a chili relish and a curry (your choice; we picked vegetable). 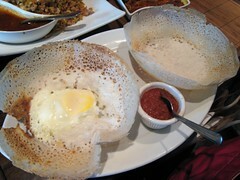 One of the hoppers came with an egg dropped in the bottom, like a Sri Lankan version of egg in the basket; they had a tender texture and reminded me of a cross between the rava masala dosai and the uppadam I'd eaten at Chennai Garden. The vegetable curry that came with it wasn't notable, so I just ended up eating pieces of the salty, buttery hoppers alone. Smearing them with the tangy chili relish kicked them up to another level, and since there were four in an order, there was enough for everyone and then some. 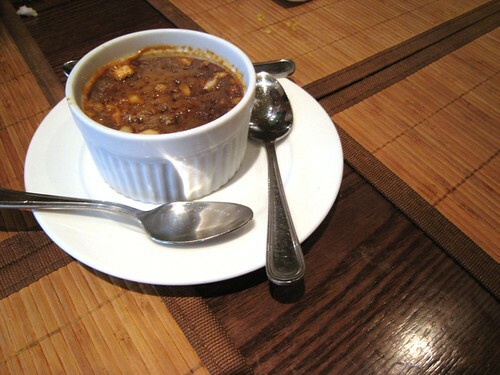 Finally, for dessert we shared an order of wattalapan, "baked mousse prepared with brown palm sugar (jaggery) and cardamom." 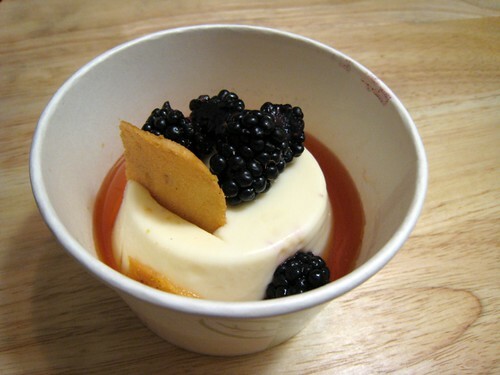 Unlike what the description had led me to believe, the wattalapan was more like a stiff custard or a flan, with a solid, jellied texture and cashews studded over its surface. It was pleasant and not too sweet but it wasn't something I'd crave; I was glad I tried it though. 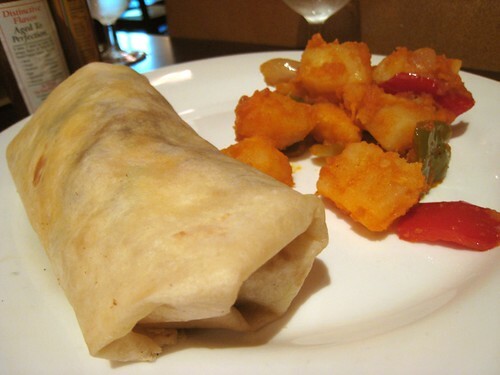 Having access to so many different cuisines is part of what I love so much about New York City. Though the dishes at Nirvana were a little uneven, and though I don't have anything to compare it to, I thought it was pretty good overall and was really happy about being able to taste so many different things. 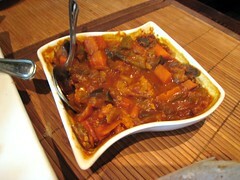 The next time I'm looking for something unusual to eat, I just might go back to try the rest. 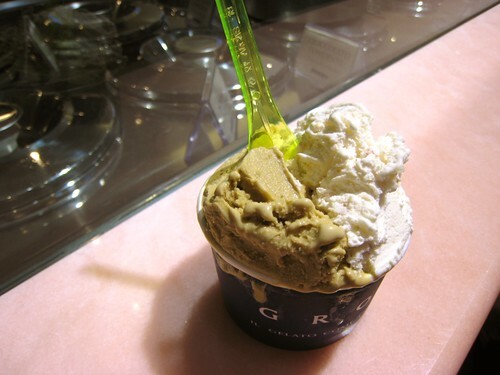 One of my only regrets about the week I spent in Italy during my junior year in college is not consuming enough gelato. While I made my way around Florence, Venice, and Rome, I passed stand after stand displaying the pale, creamy whorls of Italian ice cream, but probably only bought a cupful once. Whether it was because I was a broke student or because I just wasn't that interested, I don't remember. All I know is that now, good gelato is hard to find. Enter Grom. AT and I came out of a class on Portugese cheeses at Murray's Cheese happily full of wine, bread, nuts, dried fruit, and the controlled spoilage of milk, but still craving something sweet. Less than a block away, Grom had its doors wide open. We chose two flavors to split; Cassata siciliana, a ricotta-based gelato speckled with candied citron, was quite delightful, but it was the nutty, buttery, never-tasted-pistachio-like-this-pistachio that won my heart. Without the characteristic neon glow and artificial almond flavor of most pistachio ice creams, Grom's version tasted like the essence of the bright green nut amplified, with a smooth, rich, earthy flavor. I can never eat regular pistachio ice cream again. I'd already eaten a whole plate of ho-hum pad see-ew for dinner at Montien Thai with TL, ID, and ID's friend J, but as we headed to the train we ran into the famed Dessert Truck and I stopped dead. I had read an entire post about all of the truck's various offerings not long before, and there was no way I was passing this one by. 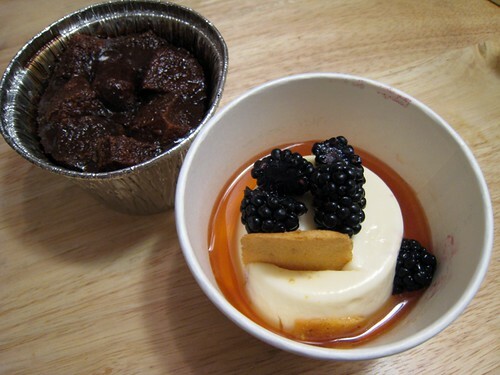 I opted for the goat cheese cheesecake, "topped with fresh blackberries, rosemary caramel, and a pistachio crisp," as well as their acclaimed chocolate bread pudding. I wasn't crazy though…I took them both back to my apartment before digging in with MH, giving myself time to digest before padding my dinner with sweets. I'm glad I waited. Not having a sweet tooth, there was no way I could have finished either one by myself, though both were quite good. Goat cheese haters wouldn't have been able to overlook the unmistakable goaty tang in the cheesecake, but luckily, I'm a fan. 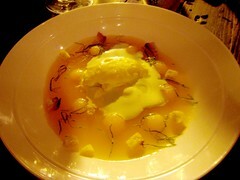 And I enjoyed the pool of rosemary honey around the cheesecake, which added a surprising herbal note. 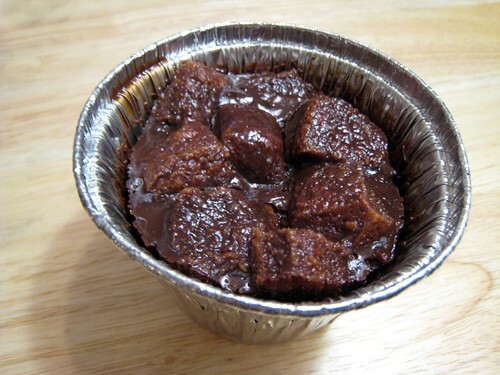 The sweetness of the honey did get sickly after a while though, and with the chocolate bread pudding I didn't fare any better. Even MH, who can inhale a pint of ice cream in about ten minutes, ate a spoonful and paused before commenting, "Oh, that's…thick." She stopped eating shortly after. This isn't to say that either of them were bad, just that they were both much too sweet. I could clearly taste the quality of ingredients, and I'm impressed that desserts at this level are being offered from a truck. For most other folks this mobile dessert vendor is probably a dream, but for me, I'm good with stopping at what I've tried. With white tile, a black-and-white motif, and an everyman name, The Smith has transformed what had formerly been a Pizzeria Uno into a bustling restaurant about ten times more hip. 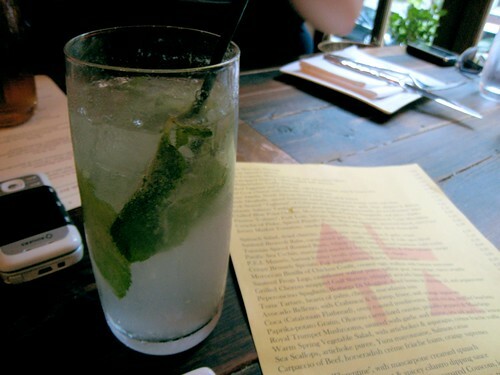 I like the casual, friendly servers, and how diners are offered bottles of both still and sparkling water at no charge. I like the open, unisex bathroom and the photo booth and vintage barber's chair that act as sentry near its entrance. I keep eyeing the massive downstairs room for some kind of special event, but none have presented themselves yet. At dinner with TC last month, really good butter arrived with a tough, paper-wrapped baguette, bread that was sadly only okay. 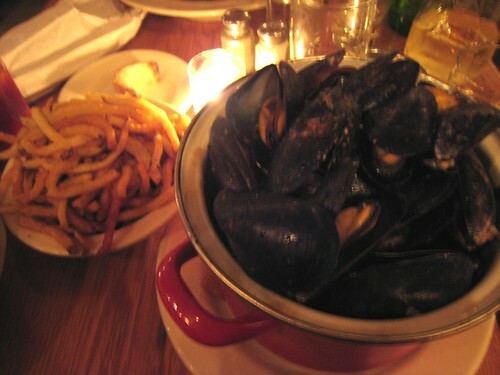 My order of moules frites featured tasty if stubby fries and passable mussels. They weren't as plump as they could have been and were just slightly tough, but their flavor was good and the sauce they swam in, divine. I dunked unshelled mussels, fries, and eventually whatever was left of the baguette into the creamy broth sitting at the bottom of the pot, trying to sop up every bit of its silky richness. 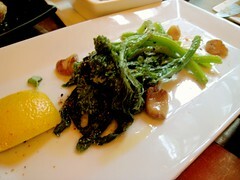 I'd had the ricotta gnocci in truffle cream the last time I'd come, and had found its sauce similarly addictive. 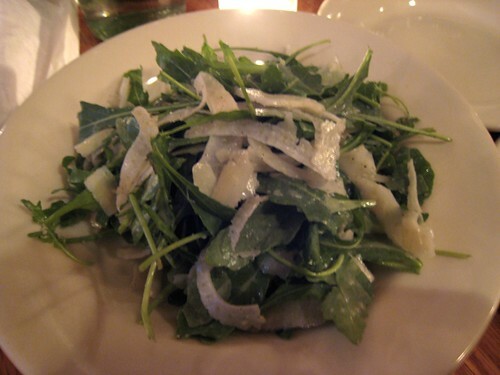 To cut things a bit I also asked for their baby arugula salad, a lemony, perfectly dressed creation tossed with thin shavings of fennel and parmesan. TC seemed happy with her meal too, enough to return just a few weeks later with our friend GQ in tow. With its wallet-friendly prices and lively, comfortable atmosphere, The Smith would probably be a regular spot for me…if only I was going to still be living in NYC. I had meant to hit up the Indonesian food bazaar in my neighborhood, but to my dismay when I checked the website before I headed out, I learned it had been rescheduled to a later date. 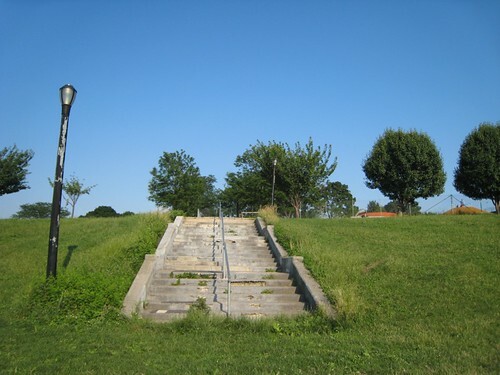 Since I had already made plans to hang out with TL though, I suggested that we head to the nearby Socrates Sculpture Park instead. It ended up being one of the most surprising days in my summer. Having only really met TL a few weeks earlier, I was delighted to discover that he has as much of a wandering spirit as I do. Over the course of an afternoon—one which turned into evening, and then night—we made our way on foot all around Socrates and Rainey Park, across the bridge to Roosevelt Island, onto the tram which took us to Manhattan, into and around FAO Schwartz, and then eventually to Midtown West, whereupon we decided it was time to feed ourselves. I'd been to Sake Bar Hagi a few other times, and while the food has never been knock-your-socks-off, it's always been comfortable and pretty decent. It's a good place for cheap and casual Japanese food. 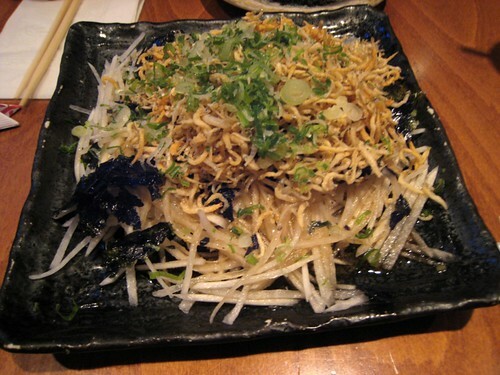 After a brief wait we settled in and chose three dishes, the first of which was a daikon and fried baby sardine salad. The heaping pile of teeny, crunchy fish paired with the daikon matchsticks was still hot, which meant the salad had a refreshing and pleasant contrast of warm, crisp, briny, and cool. Unfortunately the salad ended up being the highlight of the meal. 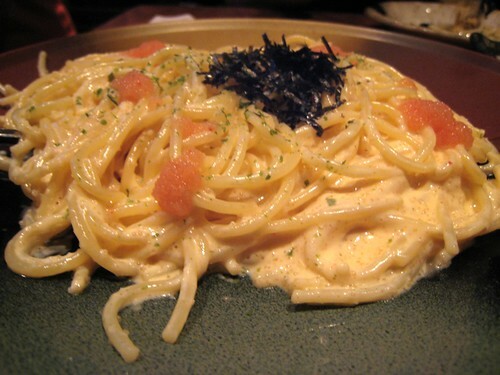 The spicy cod roe spaghetti, which I'd had at Hagi before, was thick with mayonnaise and barely spicy. I remember it having been prepared in a thinner cream sauce the last time I'd ordered it, but that night the dish was overwhelmingly gloppy and heavy. 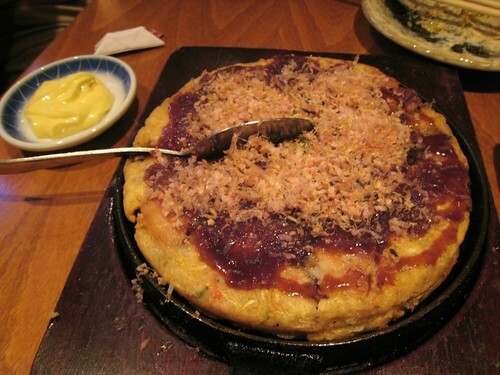 Similarly disappointing was the okonomiyaki, which was leaden and practically gluey inside. After sampling a piece each, both TL and I concluded that the rest wasn't worth it. The food at Sake Bar Hagi wasn't awesome that day, but others had plates on their tables that I was eyeing, such as the shrimp with chili sauce and some fried items, so maybe I'll still come back sometime. Post-dinner our wanderings didn't end, though they only took us as far as Rockefeller Plaza before we made our way back to Astoria where we both live. It seemed wise to save our energy for more adventures another day.